The Peppermint Plecostomus (Parancistrus sp) L-30 comes from Brazil and is one of the more beautiful plecos available to tropical fish keeping enthusiasts. 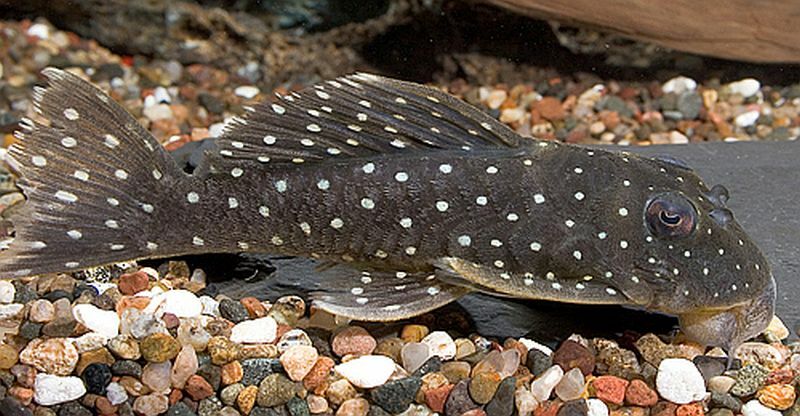 The Peppermint Plecostomus is black with very small tiny white spots over its entire body, including their fins, but because of their resemblance to the Angelicus Plecostomus, they are occasionally misidentified by tropical fish keeping enthusiasts as L-282 instead of L-30 or L-31. Parancistrus sp. are peaceful bottom dwellers that make a great addition to any peaceful community aquarium. They do well with Angelfish, South American Cichlids, Discus, Tetras, Barbs, Gouramis, Rainbowfish, Livebearers, Loaches, other Plecos and most of the smaller catfish species. The Peppermint Plecostomus does best in a densely planted aquarium of at least 55 gallon capacity with a fine gravel or sandy substrate, some driftwood or bogwood , rock work in the form of caves for them to hide in, and subdued lighting. A powerhead or canister filter can be added to provide the highly oxygenated water and moderate water movement they need to remain healthy. Rocks and driftwood will always help to accent the Peppermint Pleco’s natural habitat, provide hiding spaces for them and reduce stress. 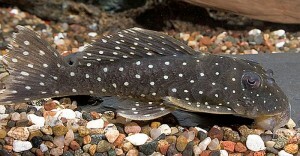 To date the Pepperment Plecostomus has not been bred in an aquarium environment. Feeding the Peppermint Plecostomus is not a difficult task. They are not picky eaters and will get most of their nourishment from the left over food and algae on the bottom of the aquarium. They should be provided with sinking herbivore pellets, a high quality flake food, and live, frozen or freeze dried bloodworms , tubifex, brine shrimp, etc. as a “treat” supplement. The Peppermint Plecostomus (L-30) is not common in tropical fish keeping shops and when available demand a relatively high price. When available for purchase, they are usually 2″ to 3″ in length.